Katie Budris hails from Chicago, Illinois where she trained in multiple forms of dance and began cultivating her love for tap as a founding member of Footprints Tap Ensemble. She minored in dance at NASD accredited Hope College where she performed with InSync Dance Theatre, Michigan's only professional tap and jazz company. Katie's early tap performance credits include Macy's Thanksgiving Day Parade, The Nutcracker on Broadway, Walt Disney World's 25th Anniversary Celebration, Dance Chicago, Chicago Human Rhythm Project, and Chicago Tap Theatre's Liason. Katie has taken class with and performed alongside many tap masters, including: Jimmy Slyde, Teddy Levy, Dianne Walker, Heather Cornell, Roxane Butterfly, Sam Weber, Mike Minery, Jimmy Tate, Omar Edwards, Dormeisha Sumbry-Edwards, Ayodele Casel, Karen Callaway Williams, and Andrew Nemr. Her tap teachers and mentors are Sarah Cook Mason, Rosanne Mork, and Mark Yonally. Katie joined The Lady Hoofers in 2012 to perform at City Hall Presents, and she quickly advanced to Assistant Director, and now Managing Director. 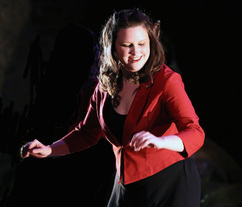 Her choreography is performed regularly by The Lady Hoofers, and has also been featured in several high school productions and Footprints Tap Ensemble's annual Tap Jam. Her piece Unchain My Heart was selected for performance at the DanceUSA Conference in 2013. In addition to directing The Lady Hoofers, Katie is a writing professor at Rowan University and Community College of Philadelphia, and is available to sub or teach private tap lessons.